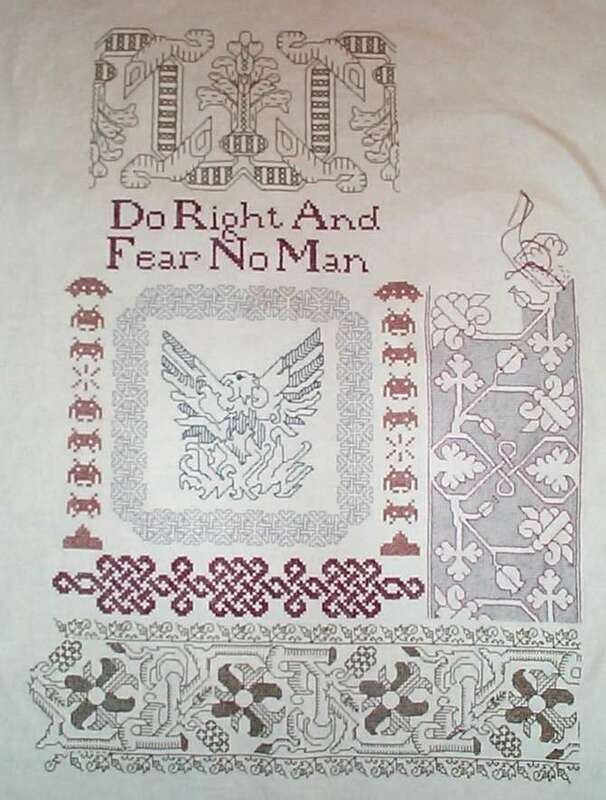 More progress on my Do Right sampler. Half cross stitch doesn’t provide anywhere near as dense a background cover as regular cross stitch or long-armed cross stitch, but it does give an interesting twill-like effect to the ground. Plus it uses far less thread. And in the realm of improvised tools and gadgets – today’s is the lowly thread reel. 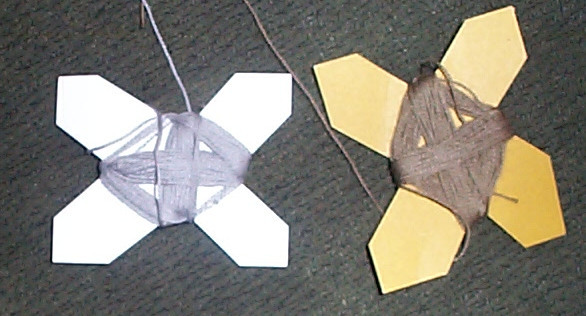 Flower Thread comes in pull skeins. Or I should say – alleged pull skeins. They are not as well behaved as standard 6-ply floss skeins. Because I hate putting my work down to wrestle with my materials I tend to wind each skein of the Flower Thread as I use it. This is a very traditional thing to do. Little flat thread winders of various configurations were common work basket items prior to the introduction of spooled and reeled threads. You can still buy bone, mother of pearl and wooden thread winders. They’re a wonderful addition to one’s general stitching ambiance, especially for those who pursue needle arts in costumed settings. But me – I’m cheap. Very cheap. I also am mostly retired from SCA events these days, and no longer need to keep up appearances. I make my own thread reels from business cards. Business cards are a renewable resource for me, new ones cross my desk almost daily. Once I transcribe the giver’s information into an electronic storage, I have little need for the small cardboard rectangles. But they are made from thicker, higher quality paperboard than index cards, manila folders, magazine inserts or other similar items. 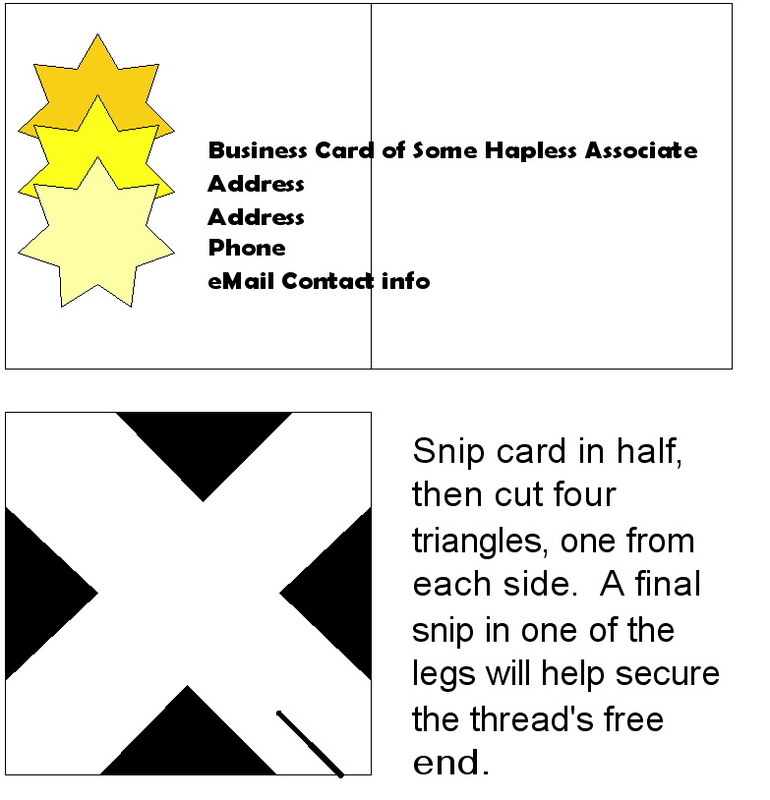 As a result business cards make sturdier, more durable thread reels. And did I mention that they’re free? One business card yields two thread reels. As you can see from my samples, precision snipping is optional. I think it unlikely that I’ll ever use my FT stash; if you’d like me to check for colors you need, I’d be happy to mail it to you. I love the new section of voided work. There are several ways to do voided work, and yours is one I haven’t seen (yet). Meanwhile, your "green project and reuse" sure is one the modern world would boggle at!